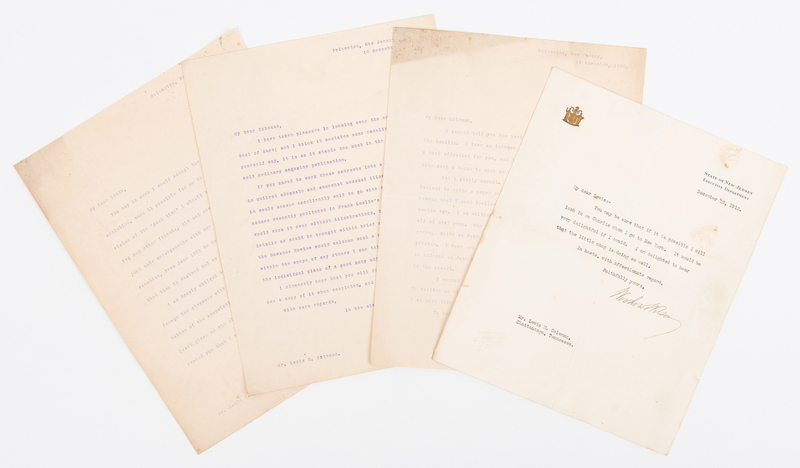 Four (4) Woodrow Wilson TLS, including three (3) as a Professor at Princeton University and one (1) as Governor of New Jersey, dated 1900-1912. 1st item: TLS. One page typed letter. From Professor Woodrow Wilson, Princeton, New Jersey, to Lewis M. Coleman, Chattanooga, TN, dated October 31, 1900. 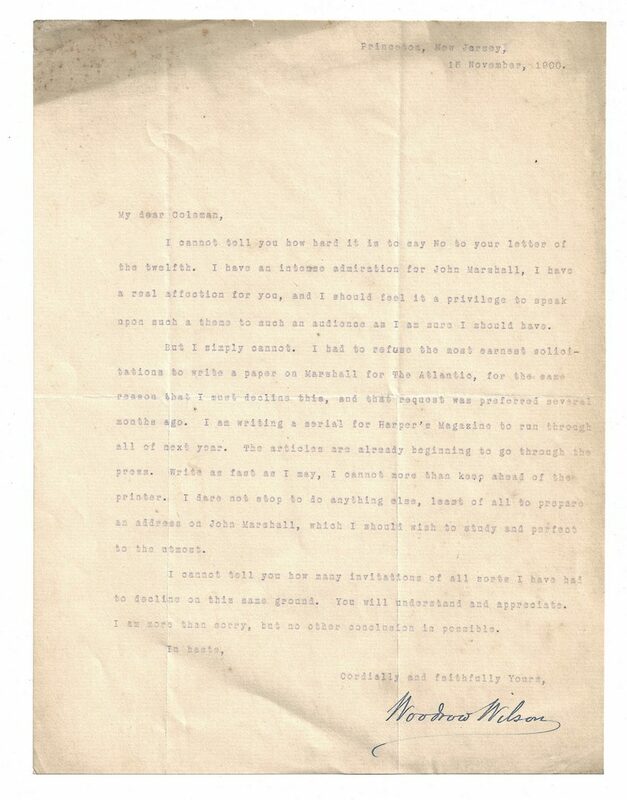 Wilson writes "My dear Louis, You may be sure I would accept the invitation of your Bar Association, were it possible for me to do so. I have a very distinct vision of the "good time" I should have, and of the pleasure of meeting and other friends, old and new. But it isn't possible. I have just made arrangements with out Trustees here to get a fifteen months' vacation, from June 1901 to September, 1902, and I hope to be during that time in England and on the Continent. I am deeply obliged to you for your part of the invitation. I forego the pleasure with unaffected reluctance; and I feel the invitation of the Association as a very substantial honour. 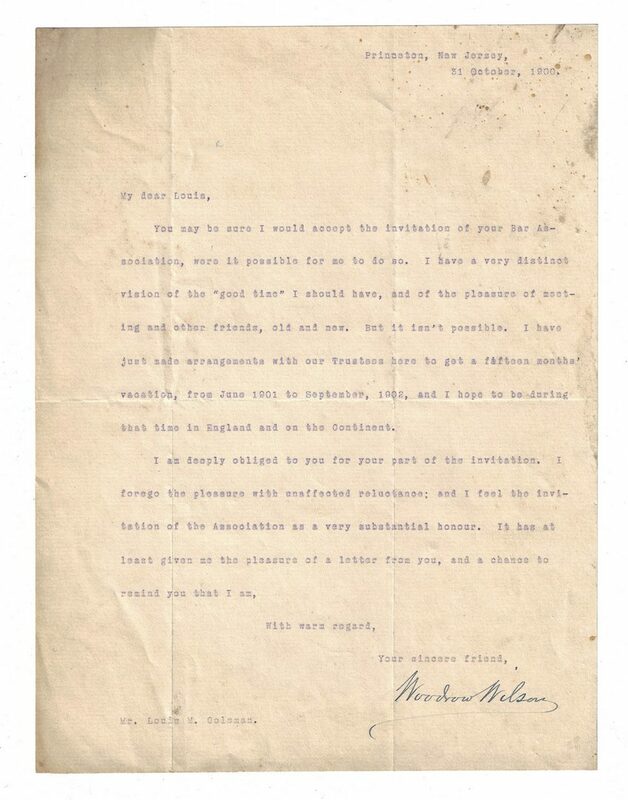 It has at least given me the pleasure of a letter from you, and a chance to remind you that I am, With warm regard, Your sincere friend, Woodrow Wilson". 10 3/8" H x 7 7/8" W. 2nd item: TLS. One page typed letter. From Professor Woodrow Wilson, Princeton, New Jersey, to Lewis M. Coleman, Chattanooga, TN, dated November 15, 1900. Wilson is writing to respond to a letter that Coleman wrote regarding the latter writing an article on John Marshall. Wilson regrettably refuses, writing "I have an intense admiration for John Marshall, I have a real affection for you…But I simply cannot. I had to refuse the most earnest solicitations to write a paper on Marshall for The Atlantic, for the same reason that I must decline this…I am writing a serial for Harper's Magazine to run through all of next year…Write as fast as I may, I cannot more than keep ahead of the printer. I dare not stop to do anything else, least of all to prepare an address on John Marshall, which I should wish to study and perfect to the utmost…I am more than sorry, but no other conclusion is possible. In haste, Cordially and faithfully yours, Woodrow Wilson". 10 3/8" H x 7 7/8" W. Note: Wilson's series of articles for Harper's Magazine was revised and published as "A History of the American People" in 1902. 3rd item: TLS. One page typed letter. 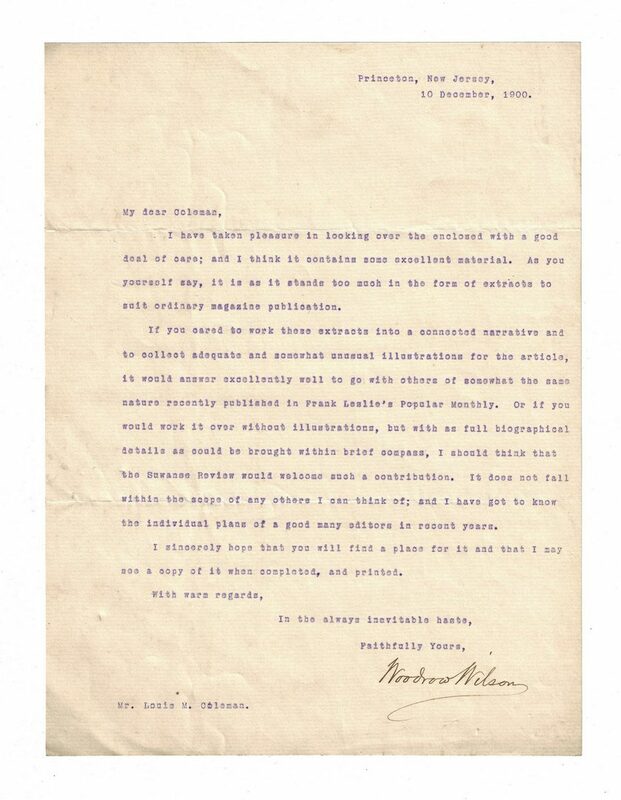 From Professor Woodrow Wilson, Princeton, New Jersey, to Lewis M. Coleman, Chattanooga, TN, dated December 10, 1900. Wilson writes "My dear Coleman, I have taken pleasure in looking over the enclosed with a good deal of care; and I think it contains some excellent material. As you yourself say, it is as it stands too much in the form of extracts to suit ordinary magazine publication. If you cared to work these extracts into a connected narrative and to collect adequate and somewhat unusual illustrations for the article, it would answer excellently well to go with others of somewhat the same nature recently published in Frank Leslie's Popular Monthly. Or if you would work it over without illustrations, but with as full biographical details as could be brought within brief compass, I should think that the Suwanee Review would welcome such a contribution. It does not fall within the scope of any others I can think of; and I have got to know the individual plans of a good many editors in recent years. I sincerely hope that you will find a place for it and that I may see copy of it when completed, and printed. With warm regards, In the always inevitable haste, Faithfully Yours, Woodrow Wilson". 10 3/8" H x 7 7/8" W. 4th item: TLS. One page typed letter. 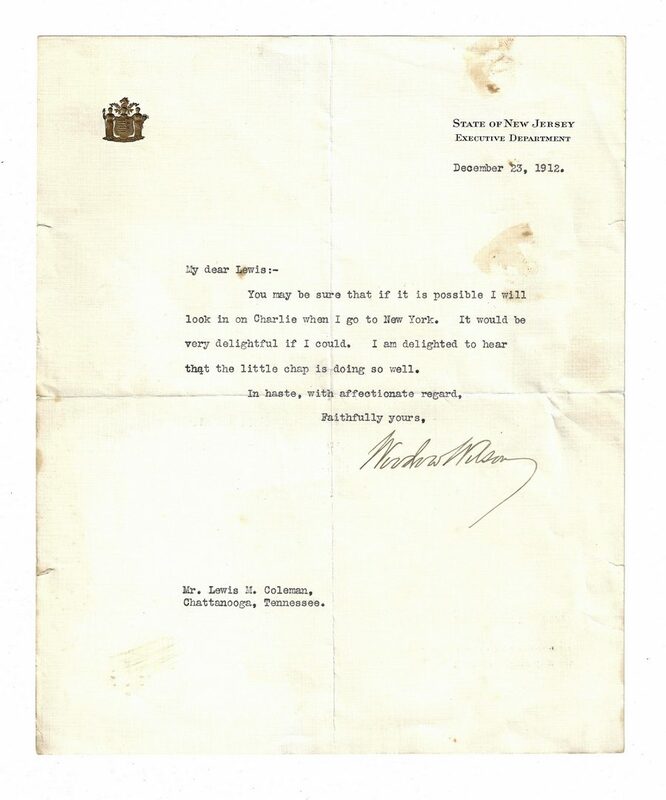 From Governor Woodrow Wilson, State of New Jersey, to Lewis M. Coleman, Chattanooga, TN, dated December 23, 1912. Wilson writes "My dear Lewis:– You may be sure that if it is possible I will look in on Charlie when I go to New York. It would be very delightful if I could. I am delightful to hear that the little chap is doing so well. In haste, with affectionate regard, Faithfully yours, Woodrow Wilson". Letters do not include envelopes. 9 3/4" H x 8" W. Provenance: The Estate of Charles Boyd Coleman, Jr., Chattanooga, TN, by descent from Lewis M. Coleman (1861-1918, U.S. District Attorney, Chattanooga), son of CSA Lt. Colonel Lewis Minor Coleman (1827-1863) and Mary Ambler Marshall, daughter of James K. Marshall and granddaughter of U.S. Chief Justice John Marshall (1755-1835). Lewis M. Coleman Jr. also was related to the family of Henry Dearborn by his marriage to Julia Wingate Boyd, daughter of Annette Maria Dearborn Boyd, great granddaughter of Gen. Henry Dearborn (1751-1829) on her mother's side. CONDITION: 1st item: Overall good condition. Wilson signature in strong, clear condition. 1 1/4" x 4 1/4" area of dampstaining, foxing spots, top left of letter. 2nd item: Overall good condition. Wilson signature in strong, clear condition. Areas of brown stains, largest 1" x 3/4", few foxing spots, surface of letter (does not affect signature). 3rd item: Overall good condition. Wilson signature strong, clear condition. Envelope with stains, tears, etc. to be expected from age and manner of use. Envelope might not be original to letter but was found with it. 4th item: Overall good condition. Wilson signature strong, clear condition. 1/2" x 1/2" brown stain, areas of dampstaining, largest 5/8" x 1 7/8", surface and en verso of letter (does not affect signature). Slight smudging to blue ink, transfer of ink to blank page. 5th item: Overall good condition. Eleanor's signature in strong, clear condition. Few minute foxing spots, surface of letter. Letters do not include envelopes.